Ducon's Selective Catalytic Reduction (SCR) DeNOx, and CO removal systems features state of the art catalyst technology and controls engineering for easy erection and quick tie-in to new or existing power plants. 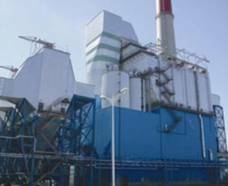 The Ducon DeNOx Catalyst is manufactured in China and has been proven in numerous power plant installations including installations in 1000 MW power plants with a NOx removal efficiency of 98%. Ducon utilizes ceramic honeycomb shapes or plate-type catalysts consisting of titanium dioxide as a base material with active coatings of vanadium pentoxide and tungsten trioxide that have been arranged at different levels. The working temperature of the catalyst ranges between 320 to 420 degrees C. for NOx systems. Ducon's DeNOx catalyst is widely used in thermal power plants, coal-fired power plants, waste incineration plants, steel plants, fertilizer plants, nitric acid plants, cement plants, petrochemical plants and all other industries which need to reduce the NOx emissions. This is also used in diesel engines tail gas treatment. Ducon also provides catalyst replacement services for existing installations. Ducon's SNCR DeNOx Systems work by injecting ammonia or urea into the radiant and convection regions of a boiler to treat the flue gases, so the reduction reaction can take place. 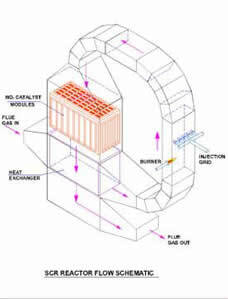 The reagent comes in contact with the NOx in the flue gas within a specific temperature range. For urea, this range is approximately 1600°F to 2100°F. For ammonia, the range is lower at 1500°F to 1800°F. Ducon's SNCR system has low capital equipment cost, and is extremely versatile. It offers economic advantages over the SCR systems when combined with other technologies. Ducon's SNCR technology can be used in many industries including power, steel, cement, petrochemical, waste to energy, glass and many others.